One of the reasons I moved to the Champaign-Urbana area was to be part of a college town. I grew up and lived most of my adult life in areas without that atmosphere. A taste of it during visits made me hungry for more. It's like an infectious disease that you don't want to get rid of. The feeling that you forever want to cheer for your team. Whether you are a local, an alumni or just a fan, there's a hotel right in the middle of sports land at the University of Illinois, where you can get right in the action for that team, or your home team when they come to town. The IHotel opened in August, 2008, complete with a Houlihan's for spirited cheer before and after the games (and during for those who can't get tickets). It is directly across a short road from the Big Ten action of Illini men's basketball at Assembly Hall, down the block from the football team's Memorial Stadium and a nice walk to the Atkins Tennis Center or Huff Hall, where the current No. 1 in the country Men's Gymnastic Team plays. I wanted to experience the basketball game from the I Hotel & Conference Center point of view, so I arrived at the hotel about an hour before. I took a brief tour of the hotel, with modern rooms and facilities and what seemed like a flood of Orange and Blue clothing. 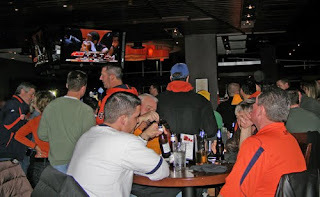 There were hundreds of people getting ready for the game, many of them heading from the rooms to Houlihan's. It's quite a scene, with a packed bar and drinks flowing. Some were eating at the tables, which sometimes fill up with reservations a week before the game. There was a flood of empty beer bottles and glasses of every kind suddenly hitting the bar a half hour before the game, as the majority of people - many regulars who come in pre-game, the rest travelers who stay at the IHotel and watch for the whole experience -- left for Assembly Hall. While the crowd took off, I enjoyed the game and the atmosphere. I had some delicious Grilled Vegetable Pizza and the people next to me raved about the Lettuce Wraps and the Rare Seared Tuna Wontons (there is also a full dinner menu), but it's more about the drinks when I'm checking out a place. There's no shortage of drinks at Houlihan's. They go through five cases of Miller Lite on a game night, as well as a keg of Bud Lite and plenty of other brews, but it's not all about the beer here. The endless variety includes Wine Flights, eight Flavors of Long Island Iced Tea and an incredible selection of Martinis. There's even a Mini Martini Flight that allows you to sample 3 for $9.99. The Martinis were calling me and I had a blueberry in my hand before long. The combination of Stoli Blueberry Vodka, Blue Curaco, pomegrante and cranberry juice, with fresh blueberries floating through was just delicious. The menu also includes such unusual drinks as the X-Rate Fliritini-Champagne, X-rated Fusion Liqueur, orange juice, mango and Brazilian passion fruit; and Zen Green Tea Martini-Zen Green Tea Liqueur, Skyy Vodka and Ocean Spray White Cranberry Juice. I decided to skip the delicious mini desserts this time (White Chocolate Bannana Cream, Pie, Bourbon Pecan Pie or Chocolate Cappaccino Cake) in favor of the Chocolate Smoothie Martini. As if Absolute Vanilla, White Creme de Cacao, Dark Creme de Cacao and sweet creme weren't indulgent enough, it arrived with a Hostess Ding Dong perched on the side! The bartenders here pull out all the stops in service, mixing and presentation. It wasn't long after I finished enjoying my piece of chocolate heaven that the crowd started coming in, filling the place with gameday celebration. The drinks were once again flowing. Drink specials are available at Houlihans at the IHotel everyday. On game days you wil find $6.00 appetizers and $3.50 for 20 oz beers. Wednesday is half price wine day and you can see a live band there on Tuesday nights. There are catering facilities at the IHotel for weddings, events and classes, as well as dinners for the visiting teams (Indiana's women's basketball team was enjoying dinner when I was there). In addition to the Houlihan's restaurant, there are 126 rooms, (with two suites), a fitness center, spa room for massages and the ICafe for coffee, snacks and breakfasts. There are frequent packages and specials, visit the IHotel's website or call 217-819-5000 for details. It's only two hours from Chicago, St. Louis or Indianapolis, so it's a great stopover location. And don't forget to save room for the Chocolate Martini!